A vacation is supposed to be a getaway, but getting out of your comfort zone can be stressful, too. Missed flights, lost luggage, busted budgets—there’s a lot that can go wrong when you travel. In fact, it’s more or less inevitable, says Lee Huffman, a travel blogger at BaldThoughts.com. There are, however, a few ways to hedge against Murphy’s Law and minimize the stress of preparing for a big trip. We asked Huffman how he manages travel with his family and how the rest of us can plan for an epic, stress-lite vacation. - If you plan on using the car rental insurance that comes with your credit card, research what’s actually covered. Most have limitations. - Don’t assume English is spoken everywhere you go. Research local customs before you leave and download a translation app just to be on the safe side. - Make sure you know your airline’s rules for traveling with children or pets. Many airlines charge extra for everything from picking a seat to printing your ticket at the airport. If nothing else, you’ll have a story to tell when you get back from your trip. 2. GET YOUR MONEY IN ORDER. There’s often stress over whether you can (or should) afford the vacation in the first place. Maybe I should wait until prices drop, you think, or maybe I should just skip traveling altogether. Of course, having your money in order is easier said than done—but once again, it all goes back to proper planning. Start saving for your trip early so you’ll have a vacation fund to draw from when the time comes. 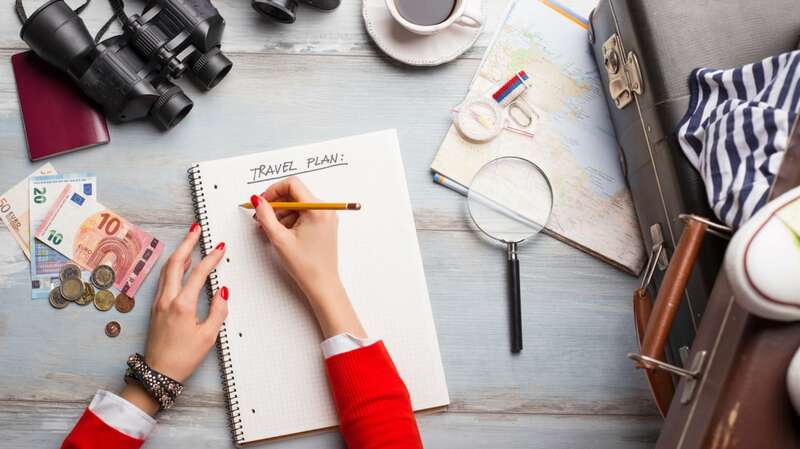 “Even if the savings is just a fraction of your overall vacation expense, that money will help reduce the sting of paying for airfare, hotel, and everything else you've planned,” Huffman advises. It’s tempting to squeeze in as much as possible when you travel, but don’t set yourself up for a headache. Make a list of “musts” and “maybes”: things you just have to do and things you’d like to do if you have time. When you prioritize your sightseeing this way, you can relieve yourself of the pressure to see everything. You’ll actually have time to enjoy yourself. It can be helpful to plan your lodging accordingly, too. The closer your proximity to the activities on your list, the more you can fit in (and still easily bop back to the hotel for an afternoon nap). At the very least, you can book a hotel or Airbnb that’s close to public transportation so you can get where you need to go with ease. 4. GIVE YOURSELF SOME BUFFER TIME. The worst thing about a vacation is coming back from it. Especially if you have to jump right back into work, the return can be jarring. If possible, you can ease back into work mode by giving yourself some extra time to relax when you get home. As an added bonus, he says, it’s typically cheaper and less crowded to fly on Saturdays than Sundays, anyway. And if your return flight is delayed, you don’t have to worry about making an awkward phone call to your employer explaining why you need to extend your vacation. 5. PREP FOR YOUR RETURN. There’s nothing worse than walking in the door after a long journey and being greeted by a filthy, smelly home. Set yourself up for a nice homecoming by doing some pre-trip cleaning and go grocery shopping for snacks that won’t go bad while you’re away.